This was the third time during this trip that we were remembered, which is truly a very nice feeling. On our last visit to the Hawthorne, back in January, we spent most of the evening here on Super Bowl night (as The Hawthorne, gratefully, has no televisions), drinking cocktails and having some excellent charcuterie. Now, Boston Comic Con was finally over and we were having a much needed recovery cocktail. It had been a frantic packing up of product and mad dash of getting everything back to the hotel, but that was behind us and we could finally get a drink. Most of our trips back to Boston normally always begin with drinks at The Hawthorne, as you may as well start from the top and work downward. However for this trip, we were ending the Con here. The Hawthorne is a hotel bar that I always forget is actually a hotel bar. 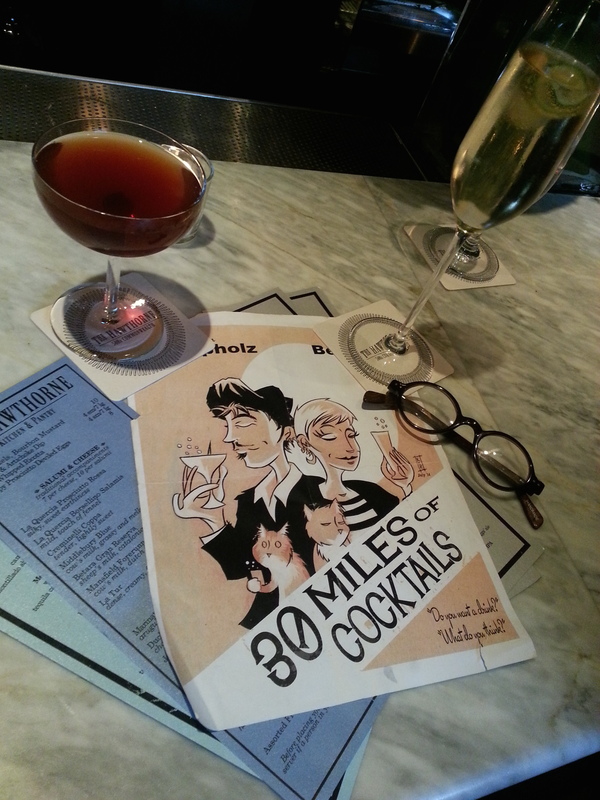 The Eastern Standard, the other great bar, is a few doors away; but I always prefer to come here. The bartenders are excellent (Megan and Jason were with us that night), the drinks are impeccable, and feel and ambience of the bar is amazing. The decor is kind of minimalistic, but not the industrial minimalism of a place like Drink in South Boston. The Hawthorne has an understated elegance and simplicity – the dark wood of the tables and floors complement the muted colors behind the marble-topped bar, allowing all the focus to be on the drinks and snacks. The low light and gypsy jazz over the speakers just add a great exclamation point on the whole experience. Yes, this place is that good. Kelly and I were coming down from the frantic pace of con exhibition. This is just what we needed. “Treat this one with respect it deserves, gentlemen!” – CHB. Gone, however, was the large bookish cocktail menu from our last visit to the Hawthorne. Megan tells us that they had gotten rid of that and replaced it with a set menu that changes every week. I found it fantastic when she told me the menus have been based on Charles H. Baker’s excellent book from the 40’s, ‘The Gentleman’s Companion: Around the World with Jigger, Beaker, and Flask’, which I had recently finished reading. As usual, Kelly also ordered a little selection from their small bites menu – the pretzel bites (which we love) – warm, chewy, with a bit of sea salt, served with a spicy bourbon mustard; and the spicy whipped ricotta (creamy ricotta mixed with sriracha , sprinkled with red pepper flakes and a drizzle of olive oil) which is served with pita and fresh veggies – a nice alternative to the ubiquitous hummus one usually finds. Megan also brought us a dish of olives to snack on as well. Kelly continued to study the small plates menu in case our hunger has not been sated. As the second round ended, we both ordered a Spencer Trappist Ale for the third. By this point, our buddy Joe S. joined us for a drink. We chatted and caught up on everything. After the third round, Joe offered to give us a lift back to the hotel. We said our goodbyes to Jason, Megan, and the Hawthorne (but it would be a brief hiatus as we were told the Hawthorne was doing a ‘Take Over Night’ at Denver’s Williams & Graham in October. We will be there. ), but the problem was that I wasn’t ready to call it a night just yet. Once back by Park Street, I suggested we have a night cap at the bar that the hotel originally suggested to us our first night in: Barracuda Tavern (15 Bosworth Street). The original idea was to stop by for one drink and to just check it out. It was located by the old ‘Littlest Bar’ that I used to frequent and is much missed (I’ve been told that it reopened somewhere in the Financial District, but that it’s a pale shade of its former self… and not so ‘little’ anymore). We passed by the overly flashy Nine Zero hotel and walk down the street back behind the Beantown Tavern… (a bar I don’t think I would ever set foot in. 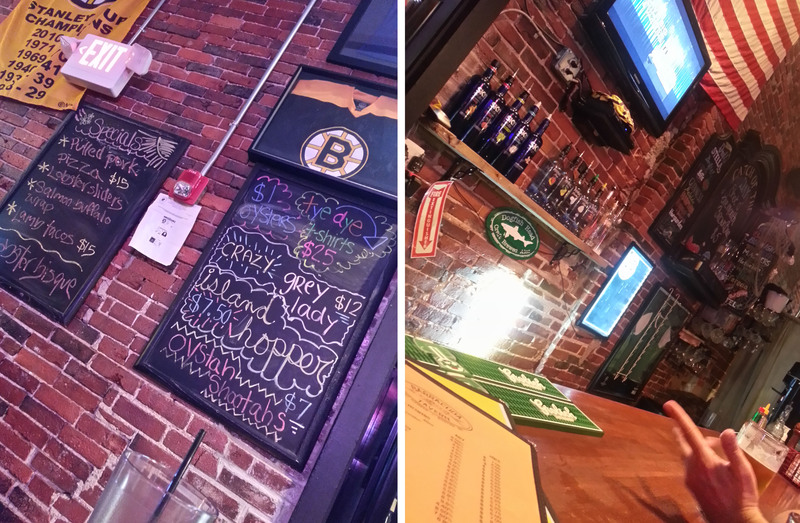 Sure it looks like a touristy sports bar [strike 1, to keep the sports metaphor going], but also ‘Beantown’? No, thank you), through the small nondescript doorway, and up the flight of steps to the Barracuda Tavern. This was our first time there and it was fantastic. A small crowd of locals sat around the bar and the few tables. As soon as we walked up the stairs, the bartender came out, shook our hands saying “Hi! I’m Mickey! What will you have?” and I was sold. There were no fancy cocktails here. No, this is your father’s bar. This is a beer and a shot bar. Old reggae played over the stereo. There beer selection was amazing and a quick look at the food menu posted up on a chalkboard (pulled pork pizza, lobster sliders, salmon buffalo wrap, Lamb tacos…) had my eyebrow raised and wondering if the small plates we had at the Hawthorne were enough. Kelly went for a Yuengling while I decided the try the House Stout. The idea of having “just one more” was quickly fading away as we talked to Mikey, Matt (“Wait, you do a comic about bar stories? I can give you bar stories!”), and some of the other regulars (including a gentleman from Scotland who commutes for work to Boston every couple of weeks.) The Boston accents were thick and made us feel right at home. Sure, there was some gentle ribbing (“You were at the Hawthorne? How classy! What the hell are you doing here?”) and we all laughed about it. Soon, Mickey wasn’t even asking me if I’d like another… just holding up a clean glass with a questioning look. Brilliant. 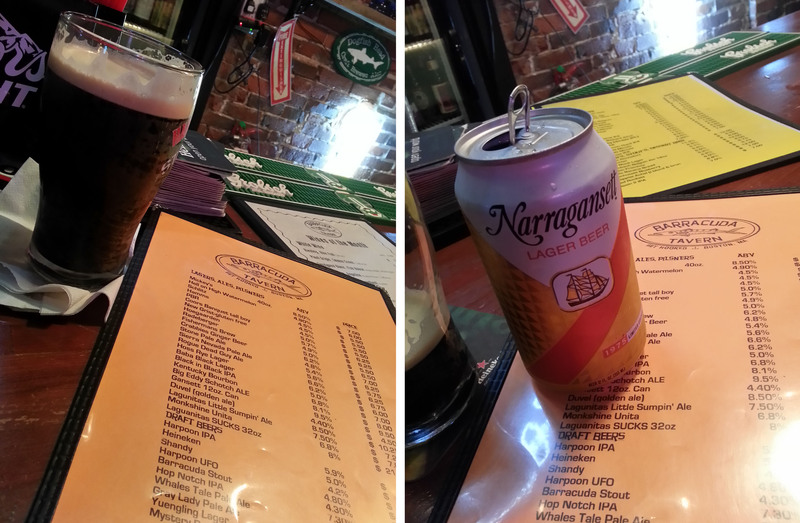 The house stout soon became a can of Narragansett (which I was happy to see was in a throwback classic can.) That ‘one last round’ also turned into four or five more. Kelly gave me that wide grin that I could tell that she was having a great time. Her large hug towards Mickey as we left only confirmed it.